Oh look who is popping in to guest host? It's Janell of Isabella & Max Rooms (check out her portfolio here or her favorite nook here). I am seriously in awe of her amazing skills - she has mastered a classic with a twist style that i just adore. Whenever she tackles a new space, I hold my breath for the reveal because I know its going to be fab. This space has a lot to appreciate - chalkboard wall? empty frames? repurposed old stuff? Nuff said. I'll let Janell take it from here.  What a pleasure to be a guest blogger here at the Brooklyn Limestone for a second time. I adore Stefanie's blog, it is the first I began following on a regular basis! I'm constantly being inspired by her wonderful sense of style and the striking photos taken during her travels. And speaking of photos, can you spot what photos of hers are in this home office I recently worked on for my husband? Here is the finished room, with a few before images thrown in for entertainment. An old cabinet, that was once in my grandfather's woodshop, has been used to create a place to catch up on a bit of work, while providing endless storage. The wall behind the cabinet is painted with chalkboard paint and a gallery wall was hung on its surface. Empty frames provide a convenient spot to write a note in. This light fixture was found at Home Depot, for nearly nothing. Its original shiny brass finish most likely scared off other shoppers, but a can of black spray paint easily transformed it. and after. The quirky animal table was one of the many items of my husbands that needed to be worked into the space. Ledges above can take the weight of magazines and books. The piles will only grow, I am most certain. and after. The sculpture by RA Miller is another favorite piece belonging to the occupant of the room. and after. The colors set a moody tone. A corner for reading has ample lighting from two windows dressed in ikat drapery panels, and the Pharmacy Lamp found at Target. The geometric rug from Ikea adds an interesting pattern to the mix, while a side table provides a necessary surface to place a drink. Coffee while reading the morning paper and something stronger while catching up on a bit of late night work. Have you identified Stefanie's three photos? Great post! I am totally inspired to transform my office. I love the room. I love the dark walls and all the photos above the desk. Lovely. Janell designs are nothing short of brilliant! I love everything about her husbands office. And stephanie, your pictures were a great touch! I would happily give Janell free reign over the design of my home. Her designs are always fabulous and she is so generous in sharing the details of her projects. LOVE this space! Love the chalkboard wall and empty frames! I just had my try at chalkboard paint~ in periwinkle. Thanks so much for having Janell today, That office is fabulous! What a lovely office! Her stuff is great! Wow! I love the gallery wall against a black background. Very dramatic. Great post! Janell's blog is a must read for me each day! She inspires my creativity! Looks great! I only wish I had as much talent in my entire body as you two do in one little finger! As a quick aside, I think some of your "before" and "after" photos are in the wrong order...at least they are on my computer! Janell, it's fun to see you in other places. You seem to be popping up everywhere! Glad to find Brownstone, too! Love everything! The frames on the chalkboard wall? Genius. Love this office! She made the dark work!! So gorgeous I can't stand it! I HAVE to do a chalkboard wall in my office now =) Running over to see the rest of her portfolio!! thanks for sharing. I love, love, love this office! The black and white frames & desk are AMAZING. Out of this world classy without being stuffy. Love it!! Especially the chalk board wall!! Isn't Janell simply fabulous? Love her and love this office. It was so much fun watching it all come together! I adore that chalkboard wall - the empty frames are a great idea! Janell is one of my favorites and she is so talented! Her office is amazing and she is so inspirational! Clever and classic is a great way to describe her office. Love this space! Such a great looking office that has flair and interest. Very impressive yet fun. That office is spectacular!! The transformation is amazing and I love the "feel" of the room after the change. The dark, broody, cozy look feels just right. If this room were in my home, I'd probably leave it very infrequently. Beautiful job! I adore Janell's work/blog - I love seeing her projects!